Properties in Novate Milanese average 4.2 out of 5 stars. Property 6: Big flat for groups. Hospitable and very close to "The Last Supper". Property 27: Hospitable and very close to "The Last Supper". 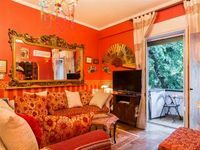 Residential flat, characteristic "casa di ringhiera"
Property 28: Residential flat, characteristic "casa di ringhiera"
Blue Grotto ★ Sleeps 5 ★ BEST Location in Milan! Property 38: Blue Grotto ★ Sleeps 5 ★ BEST Location in Milan! Feel at home in the center of Milan: near Corso Como, Brera, Gea Aulenti square. Property 46: Feel at home in the center of Milan: near Corso Como, Brera, Gea Aulenti square. Francesca was a great host, even more than superhost. The apartment is located about 100 yards from the Spanish Steps, and easy walking distance to the Coliseum, Forum and most of the sites we wanted to see. Francesca made getting there easy as she booked a driver to pick us up at the airport and deliver us directly to the apartment. The flat was lovely had all the amenities we could hope for including lift, which is hard to come by in Rome and was in the perfect location near restaurants and plenty of gelato stores. She provided maps and direction to various attractions, as well as recommendations for food, other sites to visit, and getting around. She stayed in contact with us during the booking, as our vacation approached and throughout our stay. The next time I visit Rome, I want to stay in this lovely apartment again. Kinda wish I could own the place actually. Great hosts! Orlando picked us up from the Airport and gave us great recommendations for our stay in Milan! He also recommended a fabulous restaurant down the street and we loved it so much we ate there both nights we were there! The apartment was in a perfect location and super close to the tram. We loved our stay and would highly recommend to anyone planning a trip to Milan!